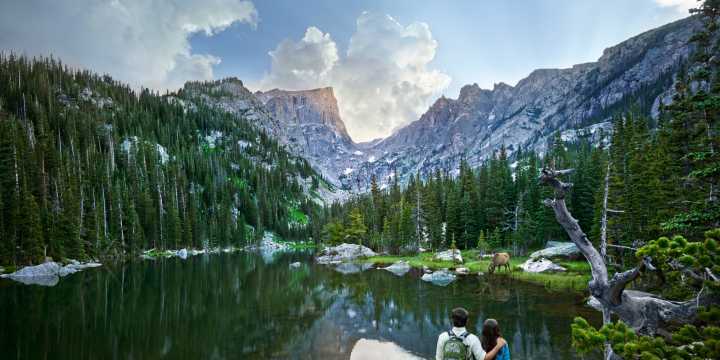 One of the perks of living in Estes is that everyone wants to visit. Not long ago, my boyfriend and I hosted three couples—close friends of his, each coming from different states. They all possessed varying levels of athletic abilities, cold-weather tolerance and zest for adventure. 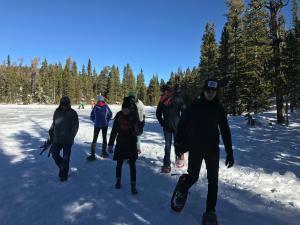 Snowshoeing, we decided, was the happy medium for everyone. Easy enough to land on our first try and interesting enough to pose a challenge. When we poll local snow-enthusiasts about the sport, we learn that around the country people race in snowshoe competitions. Much like regular running races—except harder. They tell us that the fluffier, deeper and drier the snow, the harder the endeavor becomes. We want to start off slow, and everyone recommends Bear Lake as the most beginner-friendly route. So many people go through there that even after a big storm, the trail gets packed down quickly and is easy to navigate. On the big day, my boyfriend and I wake up early to ensure finding enough snowshoes for everyone. Really, there is no need to rush. Between the five or so local outfitters, there is enough adventure gear in Estes to supply a small army. We’re also pleased to find that snowshoeing is the most affordable of winter sports—about $5 for a pair of rentals. By 10 a.m., we are at the trail head. The line snakes down the road and out of the parking lot (something we should have anticipated considering Bear Lake’s popularity and accessibility), Thankfully, the traffic moves fast. By this point, the early risers are clearing out, making room for the next wave of hikers. We’ve now learned not to be discouraged when encountering a full lot. The cycle continues like this all day—a constant flow of people coming and going. We unload and head toward the trail, where we pretend to know what we’re doing as we stealthily eye the pros gracefully unpack and clip on their sleek aluminum footwear. I struggle, not trusting that I am putting my snowshoes on correctly. Of course, it’s almost impossible to get this wrong. The process is intuitive and as easy as figuring out front-from-back and left-from-right (unless you are using 19th century wooden paddles, there should be markings), and tightening straps. But so works the thinking of the self-conscious mind when you’ve spent most of your life by the beach. We waddle around, getting used to the weight on our feet. Once everyone is strapped in, we march onto the trail, bypassing the first small loop-hike and heading toward Dream Lake, about one mile into the mountain. 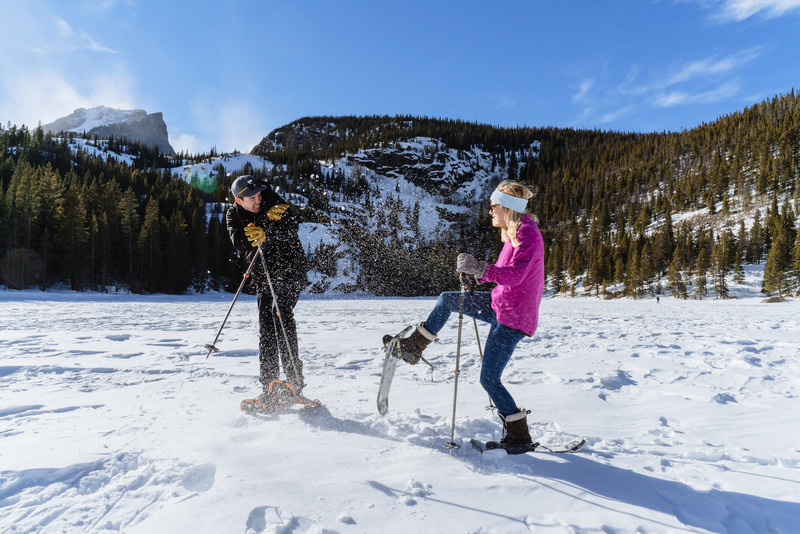 You usually don’t need snowshoes in this part of the park—unless you’re planning to hike up toward Loch or Sky Pond or a big snowfall has recently hit. Snowshoes are most effective when hiking through dry, deep, fluffy powder. Their size and lightweight material help distribute body weight evenly over the snow and prevent you from sinking. If the snow is shallow or packed-down, the snowshoes don’t have much work to do. Although we may have been able to make do with a pair of microspikes, which provide traction on icy patches, we opted for the extra support of the snowshoes. Considering our lot (some just had sneakers), it turned out to be the right decision. 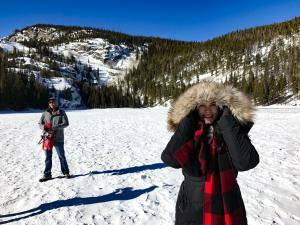 I knew from previous experience, the climb to Emerald Lake, where we intended to go, was pretty easy, but snowshoeing is a sport and it’s a different experience than when you’re hiking in boots. Even on mild terrains it does provide a workout, albeit a moderate one. About 15 minutes in, our thighs burn and our breathing grows shallower. We agree the clear panoramic views of the alpine trees and occasional glimpse of Longs Peak more than make up for the small level of exertion. Everyone perseveres. One mile into the excursion, we stand in front of Dream Lake. 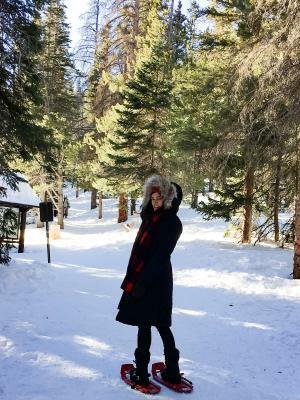 The water is iced over and dotted with pockets of families and friends taking photos of each other and gliding across the glassy basin surrounded by white-dusted evergreen trees. Like everywhere else in the park, the scene is a postcard. Even on this busy holiday weekend, we never feel crowded or over-run. That’s the thing with the park. There’s enough room for everyone. We sneak off the trail through a small, desolate patch. The snow is deep and we are grateful for the snowshoes. We tramp in solitude for a few hundred yards before returning to the main trail. The plan is to make it to Emerald Lake, another eight of a mile up, but a friend hits his limit. He’d had a big night the day before. Despite him insisting to the contrary, we abide by the rule of “no man left behind.” On the way down, I take stock of the people crossing our path. Everyone from middle-aged couples to slim-and-trim athletes to grandparents with kids. I conclude that if you can walk, you can snowshoe. Back at the lot, we unhook our snowshoes and head back to the car where others are waiting their turn. We drive off, making way for the next group of snowshoers, satisfied in knowing we completed one of Estes’ finest winter rituals. 1.Start slow. Remember that if it takes you one hour to get in, it’s going to take you another hour to get out. Whether you’re starting out in the sport, or trying out a new pair of shoes, start with a 15-20 minute hike each way. 2.One size (almost) fits all. Rentals tend to come in uniform shapes and sizes, and that’s OK for short, easy hikes, but you’ll find that the bigger and heavier the person (even if it’s just thanks to a heavy pack), the larger the snowshoes should be to properly distribute body weight and prevent sinking. 3.Dress accordingly. Sneakers will do if you’re tackling an easy, packed-down trail, but for tougher hikes, pair the snowshoes with waterproof boots. 4.Don’t go it alone.We were on a highly-trafficked path where it’s hard to get lost, but many consider the real fun in snowshoeing to be exploring uncharted territories. Backcountry routes and trails with fresh powder. It’s easy to get lost when the snow blankets over everything. If you prefer to hike alone, use an App, like iNeverSolo, which allows you to track and share your route. 5.Pack snacks—and plenty of water. Snowshoeing burns 600 calories per hour on average—about 45 percent more than running or walking. That’s a lot of energy you’re using up. You’ll hike longer and feel better, when you’re properly fed and watered.